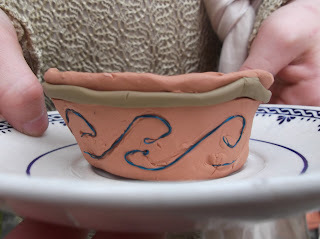 She filled her little bowl with her first tries at Flymo clay modeling (she got a set from her lovely auntie for her birthday) but I think her jug is very impressive! 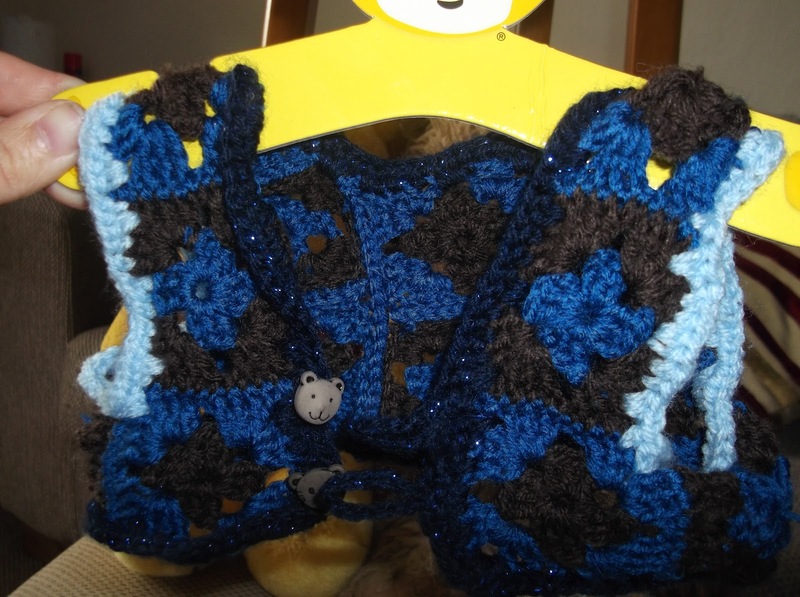 I marked the outside pattern with a stylus but it didn't stand out enough for me so I found some blue beading wire in my bag and cut some small pieces to curve into the pattern. 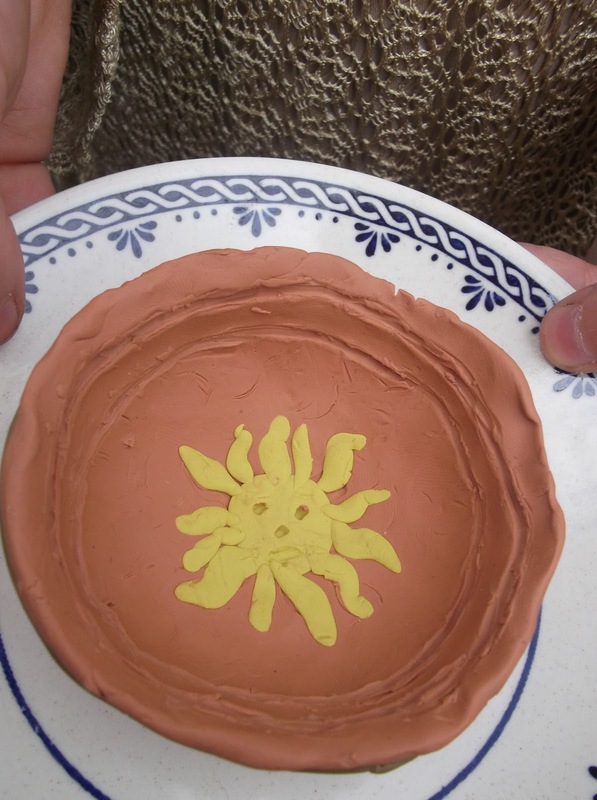 Inside is a solar piece pressed into the bowl :-) I really wish these were in clay-I have no idea how to preserve plasticine. 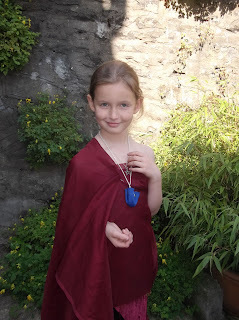 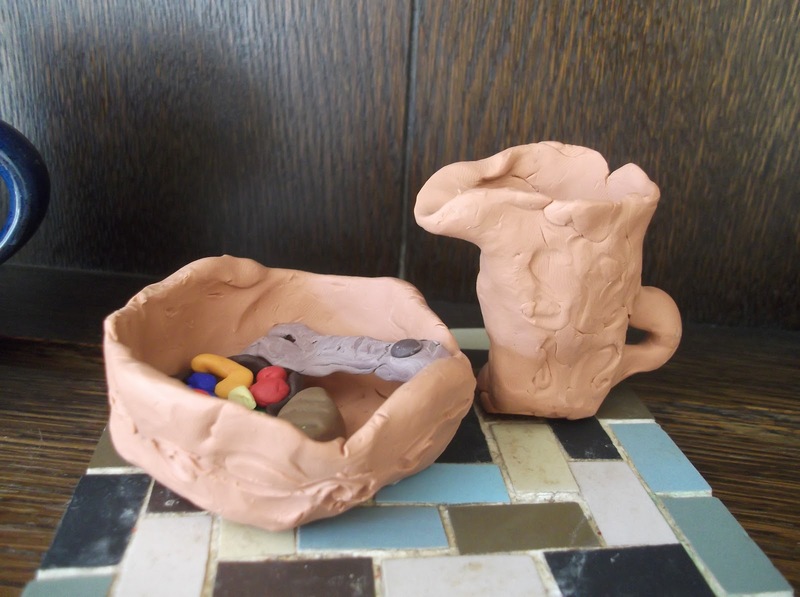 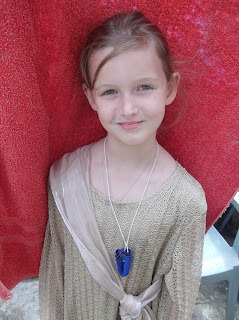 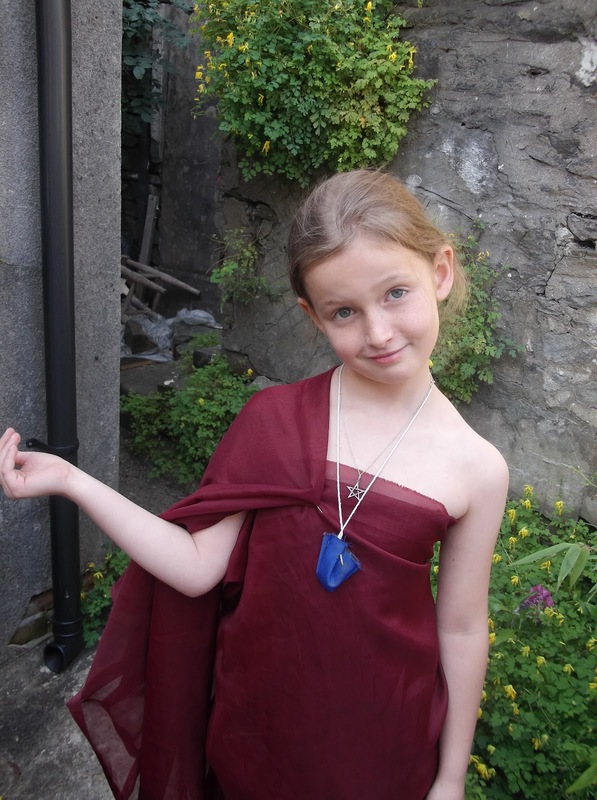 Myf also made a 'Bulla' which is a type of charm pouch that Roman children would wear-they'd place special items inside (coins for wealth, good luck items, etc) and wear it until they reached adulthood. 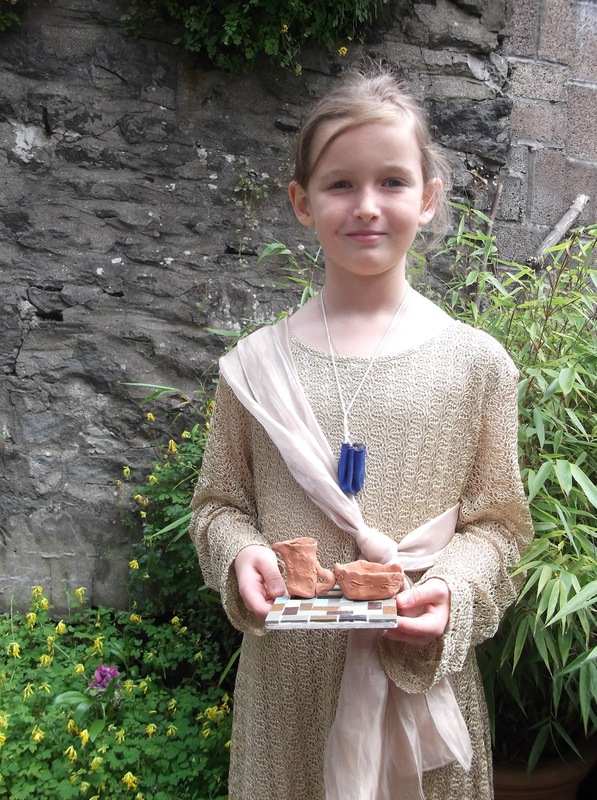 Myf took part in a competition as well-to draw two pictures from a set of descriptions about what a Celtic Warrior and a Roman Centurion looked like and she won! 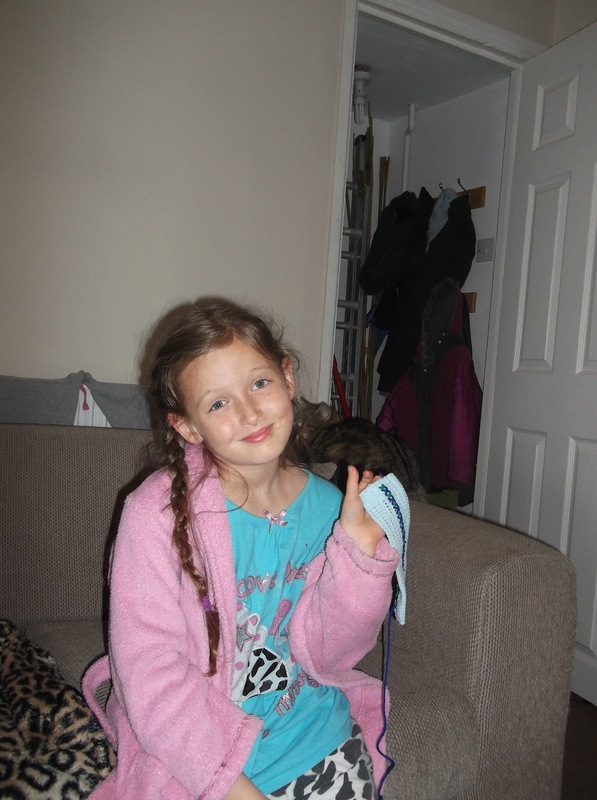 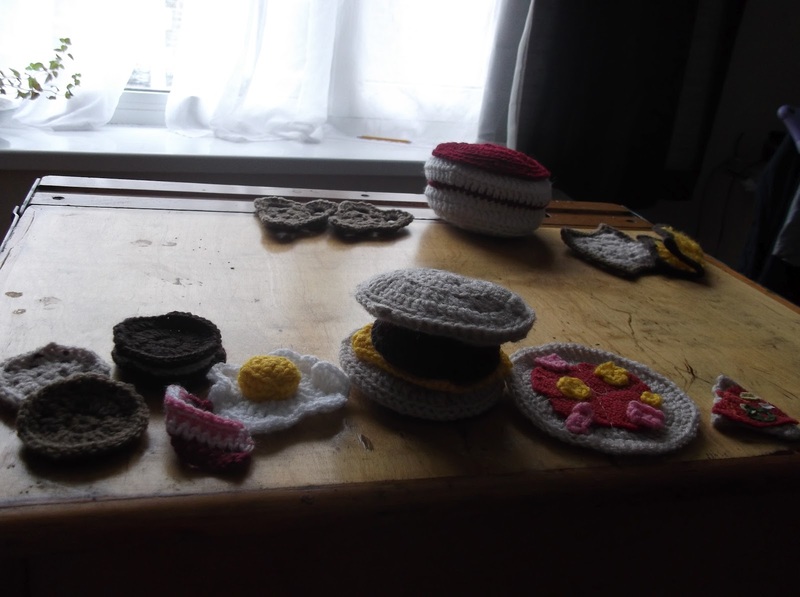 She got a little set of imitation Roman coins that she put into her Bulla :-) I'm thinking of making Bulla pouches with the kids at one of our Sowing Circle Moots-it's great fun! 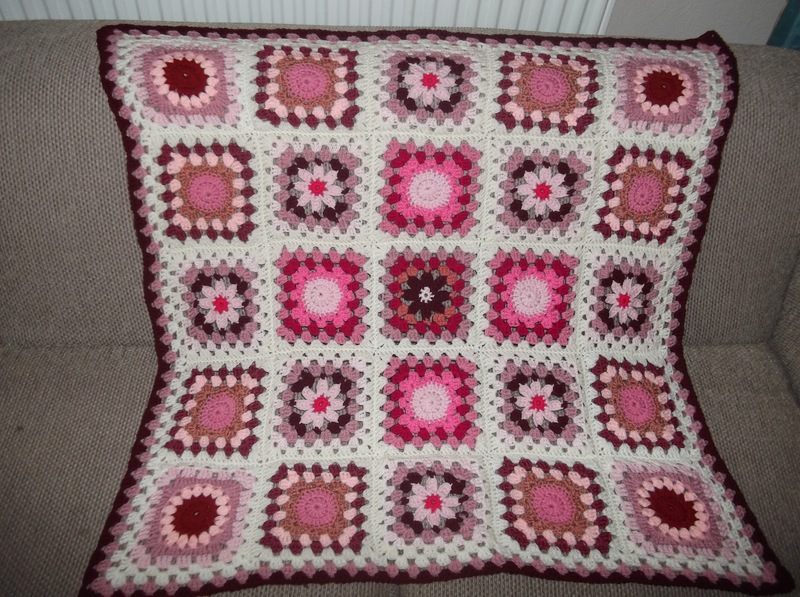 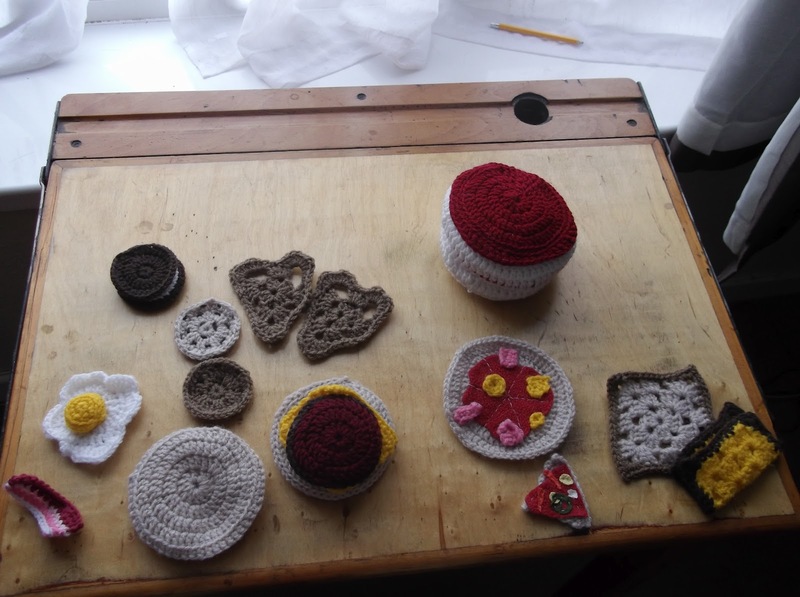 Right back to the granny squares, lots to make! 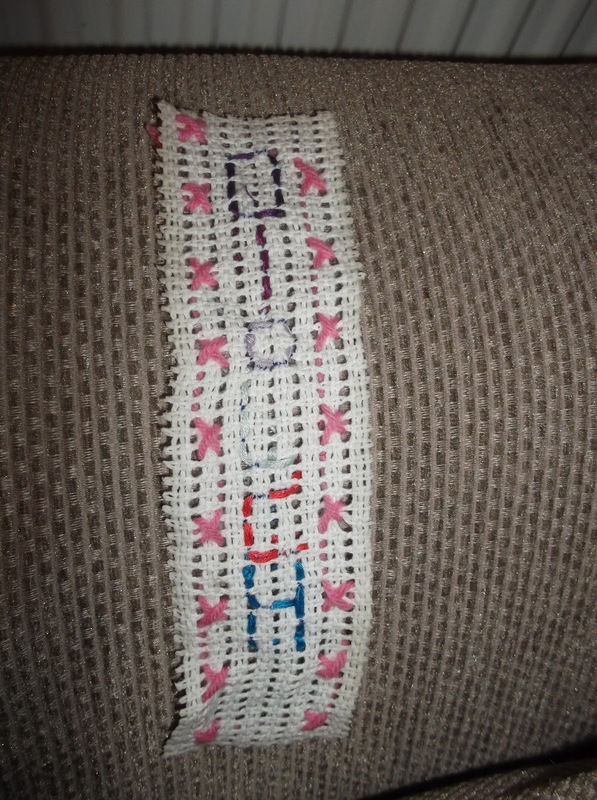 Sadly, I didn't stuff the head enough and it came out a bit wonky :-( As a first attempt I think it's not too bad although I'd love to know how exactly you can stitch these things together without going completely mental! 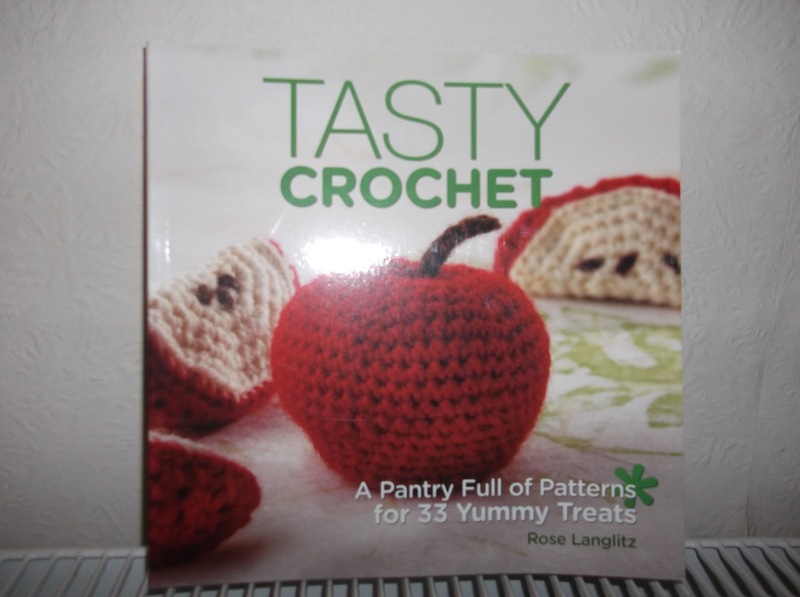 The book is lovely but I found it difficult to follow-it presumes a lot of knowledge but I do like how the patterns are laid out. 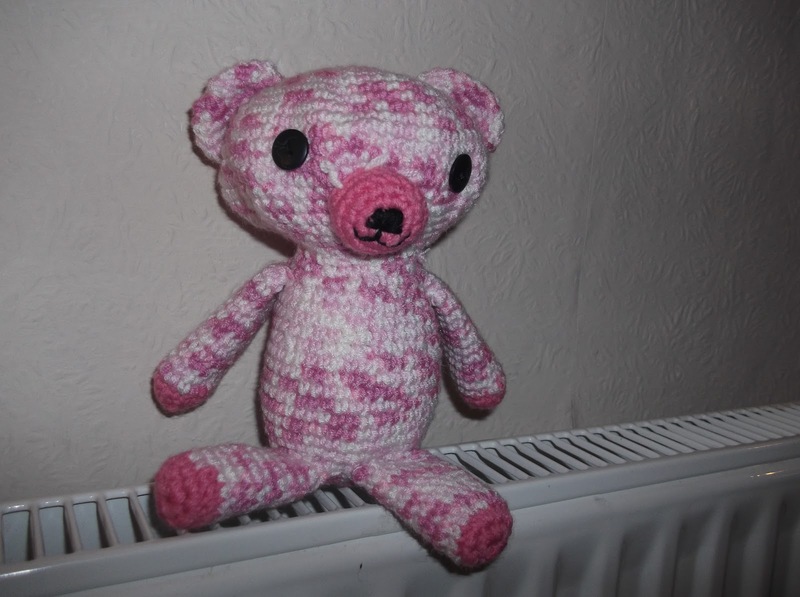 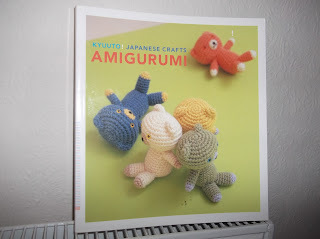 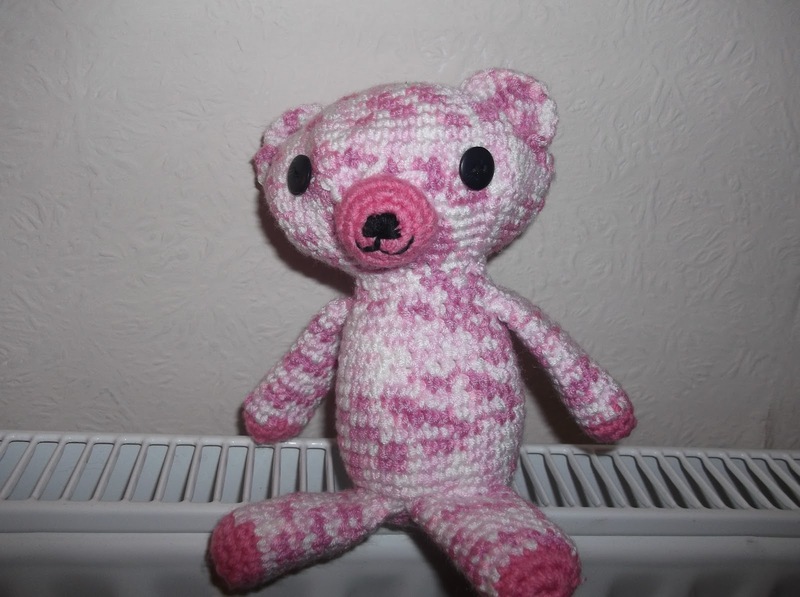 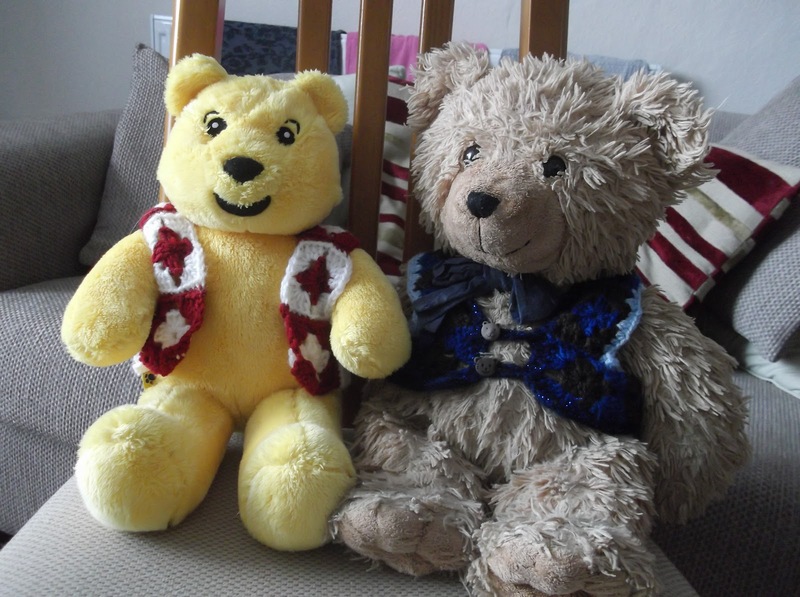 I think I need a lot of practise-maybe I'll be brave enough to attempt another amigurumi toy for my nephew or one of my niece's next birthdays. My beautiful little (big!) 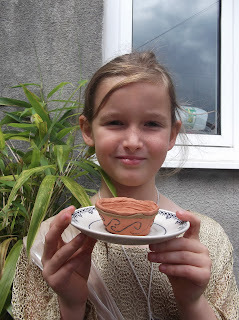 girl has always loved making and creating things. From intricate pictures to interesting sculptures made from straws and pom-poms, she really delights in being crafty. 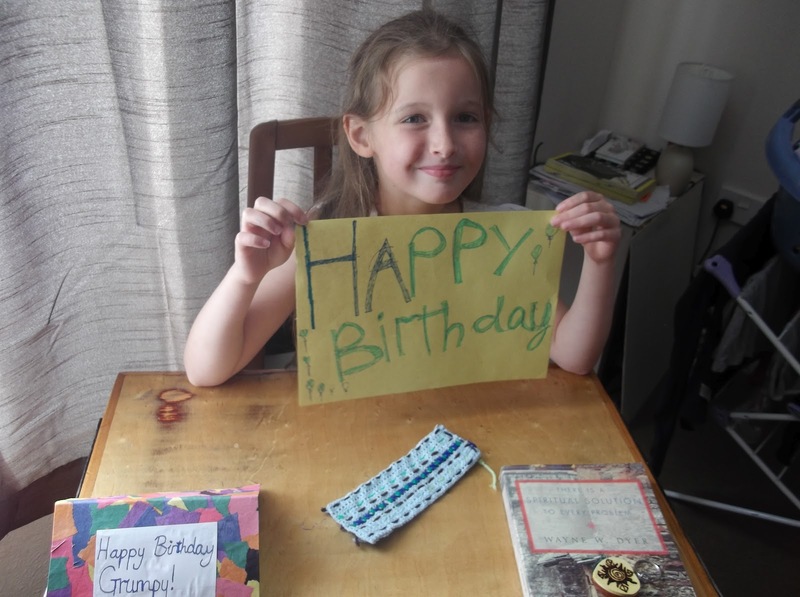 Her class this year did quite a lot of crafts-from Batic to Cross stitch so for my Dad's birthday, she made a little bookmark. 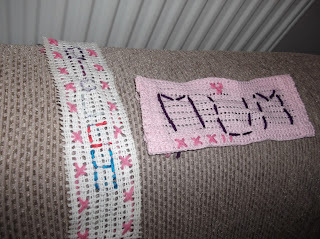 There's a slight difference in these two bookmarks-as I said in my previous post, I'm not great at hemming and it did cause problems for Myf while she tried to get it finished so for her teacher's one, after I cut the shape out, I painted the edges with clear nail varnish and let it dry before Myf started stitching. 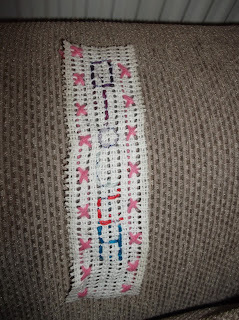 It looks much better than my hemming attempts! 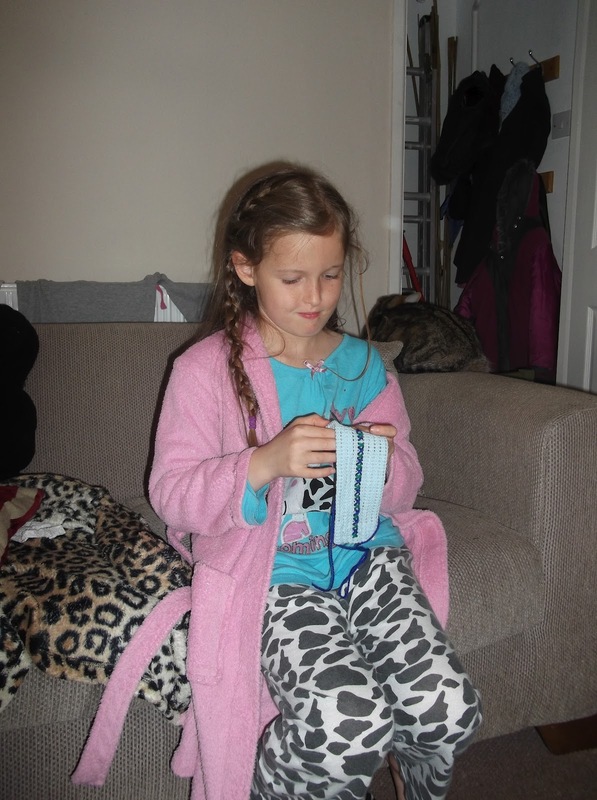 Myf is going to take a little break from all that cross stitch but I really loved watching her work :-) Especially as she would sit and stitch while I crocheted...aren't we a crafty pair! Lots of posting at the moment-I have some catching up to do! 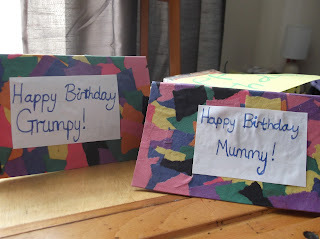 My Dad's birthday was a few days ago and Myf and I made a couple of special items. 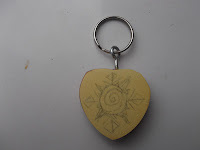 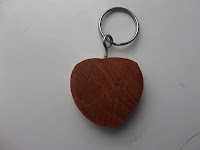 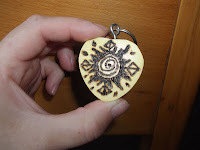 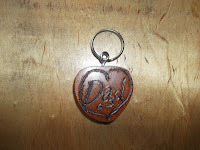 I got hold of a wooden blank keyring to embellish with some pyrography-here's some before and after shots! 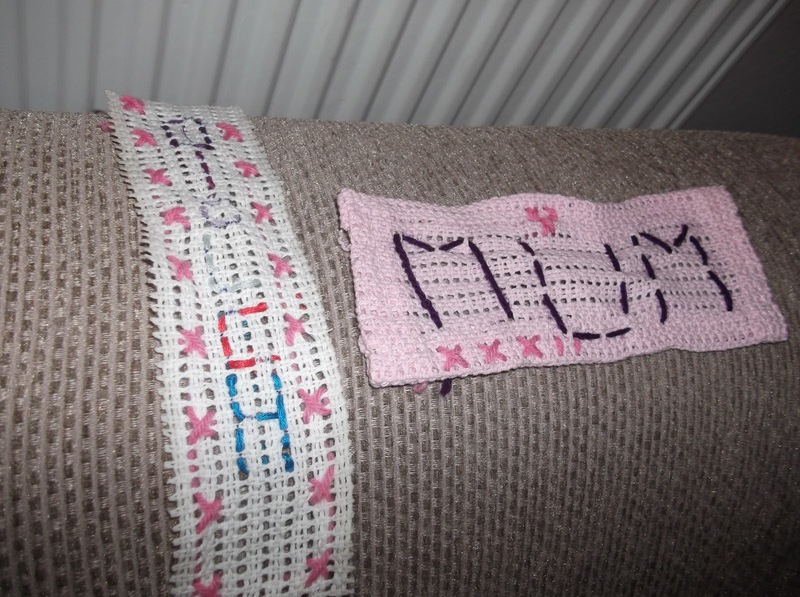 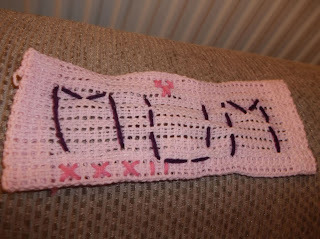 Myf has been doing a little cross stitching at school and decided she wanted to make her Grumpy a bookmark. 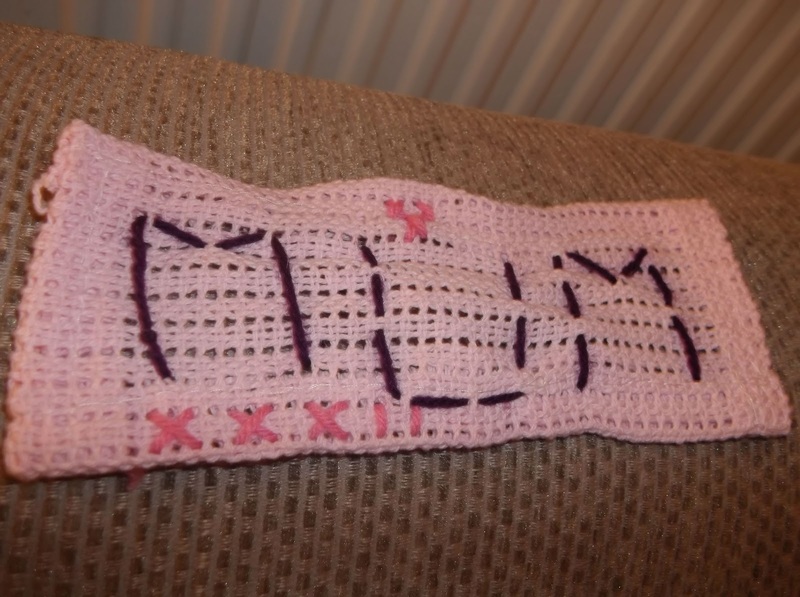 I tried to find some mesh material for her but it was a bit on the pricey side so instead we bought a mesh style baby blanket from a pound shop, cut it down and hemmed it (my hemming skills are a bit pants!) 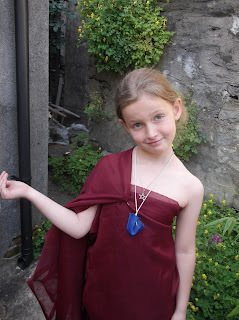 and Myf made up her own design! She worked really hard on it and it's beautiful. 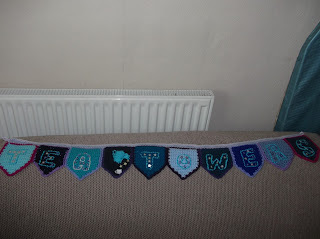 I was positive I'd taken a close up pic but this is the only one I have :-( Myf has been making a couple of other bookmarks so next post, I'll be showcasing her crafty-ness! Dad really liked his presents and hopefully had a great birthday! I sent her a little starter kit for pyrography (wood burning) which I think she'll be amazing at and I also finally finished a little crocheted bunting banner I've been working on for ages....the pattern is from this lovely blog and I'm planning to do a couple more as Christmas banners, The blog has many really beautiful crochet ideas so you should have a look! My last post showed a blanket I'd made for my friend Catrina-her boyfriend's aunt has seen them and really wants three which is very exciting so I'm working on those too. 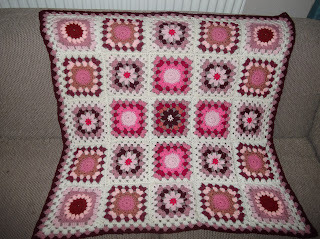 The wool store where I get a lot of my stash asked me to make a little lap blanket/baby blanket to display there-it may drum up some interest and give me some idea of whether there's any chance of doing this semi-professionally. I've been working on a couple of other projects as well but I'll save that for another post!